Establishment of the Nakatani Electronic Measuring Technology Association of Japan was permitted by the Minister of International Trade and Industry in Japan. Mr. Taro Nakatani assumed the position of President. The foundation launched Grant Programs for “Biomedical Engineering Research”, “Research Study”, and “Technology Exchanges”. The foundation’s first annual report was issued. Grant Program for Research Study was initiated. Grant Program for Technology Exchanges was initiated. The foundation published its 10th year anniversary commemorative booklet. The foundation celebrated its 20th anniversary since establishment. The foundation’s office was relocated to its current location at the Art Village Osaki Central Tower in Osaki, Shinagawa-ku, Tokyo. 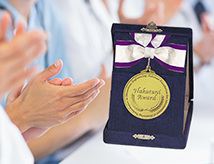 The Nakatani Award was instituted as a new commendation program. The foundation transferred its status to a public interest incorporated foundation under the jurisdiction of the Cabinet Office. The foundation changed its name to the “Nakatani Foundation for Advancement of Measuring Technologies in Biomedical Engineering”. The foundation accepted a contribution from the bereaved family of late Mr. Tadashi Nakatani, then Director of the foundation who passed away and was the son of the late founder Mr. Taro Nakatani. Dr. Isao Karube assumed the position of President (current president). The foundation additionally launched Grant Program for Science Education Promotion. A ceremony commemorating the 30th anniversary of the foundation’s establishment was held (at the Imperial Hotel).